Figure 8.9 CT of the previous case, coronal view. The cholesteatoma is located in the epitympanic area. The middle ear is free. Figure 8.10 Right ear of a 46-year-old patient suffering from bilateral cholesteatoma. An epitympanic erosion with cholesteatoma and middle ear effusion showing an air-fluid level can be seen. CT scan (Fig. 8.12) demonstrates cholesteatoma extension into the mastoid. Intraoperatively, a fistula of the lateral semicircular canal was encountered, as well as erosion of the incus. 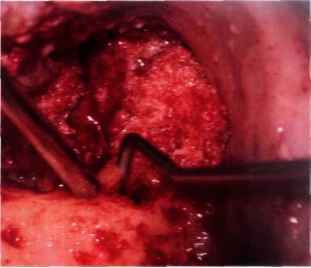 A single-stage open tympanoplasty was performed with autologous incus interposition between the handle of the malleus and the head of the stapes. In patients with bilateral cholesteatoma, an open technique is preferred. self-cleaning of the cholesteatoma debris (see CT scan, Fig. 8.12). Because of the total destruction of the ossicular chain, a second stage was programmed for functional reconstruction. 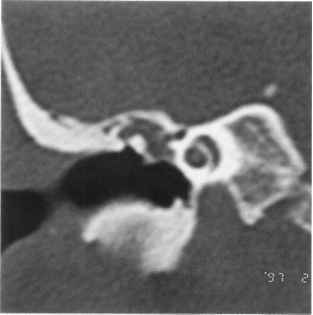 Figure 8.12 CT of the previous case showing cholesteatoma extension in the mastoid in the right ear and self-cleaning of the cholesteatoma debris in the left ear. Figure 8.13 Left ear. Small epitympanic erosion with cholesteatoma. The skin surrounding the erosion is hyperemic and everted. Figure 8.14 Left ear. 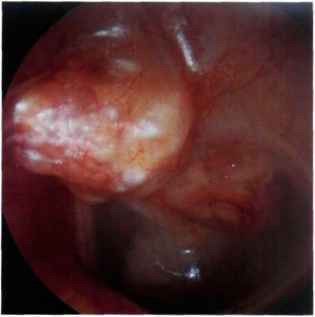 Large epitympanic erosion with cholesteatoma and fetid otorrhea. The head of the malleus and body of the incus are eroded. Figure 8.15 Right ear. Large epitympanic erosion with cholesteatoma. This 18-year-old patient did not complain of otorrhea. Ipsilateral hearing was normal, whereas the contralateral side showed severe sensorineural hearing loss secondary to a previous surgery of radical mastoidectomy. 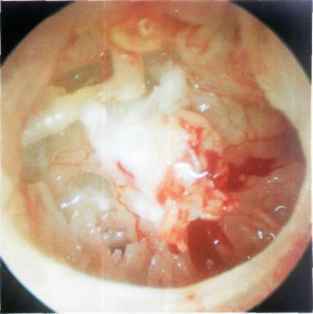 Given the intact ossicular chain, an open tympanoplasty (modified Bondy technique) was performed. According to our strategy, cholesteatoma in the only hearing ear is one of the absolute indications for performing an open technique. The reason is that this technique, if properly performed, ensures complete eradication of the pathology and better long-term follow-up, thus minimizing the risk of recurrence. Further surgical interventions, with their potential risk even in the most experienced hands, are therefore avoided. Figure 8.16 Right ear. Large epitympanic erosion with cholesteatoma and polypoid tissue that covers the head of the malleus. The pars tensa is intact. Figure 8.17 Left ear. Epitympanic cholesteatoma. Extensive erosion of the scutum with excessive cholesteatomatous debris. The pars tensa shows grade I atelectasis with catarrhal middle ear effusion. Figure 8.18 Left ear. Cystic retrotympanic cholesteatoma situated posterior to the malleus. The tympanic membrane shows bulging at the level of the pars flaccida and slight retraction with tympanosclerosis in the posterior quadrants. Figure 8.19 Same case as in Figure 8.18 during an acute inflammatory episode. Note the increase in size of the cholesteatomatous cyst. Figure 8.20 Left ear. 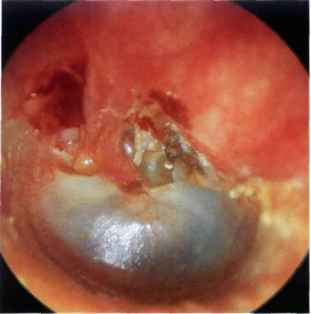 Epitympanic erosion occupied by a cholesteatomatous mass that protrudes into the external auditory canal. The mass is visible behind the posterior quadrant of the pars tensa. It engulfs the ossicular chain and extends towards the promontory and the hypotympanum. Figure 8.21 Left ear. A large epitympanic erosion is seen with epidermization of the attic and posterior mesotympa-num. The cholesteatoma, visible in transparency, causes bulging of the tympanic membrane in the posterior inferior quadrants. Resorption of the incus and head of the malleus is discernible. Figure 8.22 Right ear. Epitympanic erosion with cholesteatoma. Extension of the cholesteatoma into the mesotympa-num is seen through the bulging posterior quadrants of the tympanic membrane. Figure 8.23 Left ear. Epitympanic erosion with cholesteatoma. Extension of the cholesteatoma into the mesotympa-num (visible through the transparent pars tensa). Figure 8.24 Left ear. 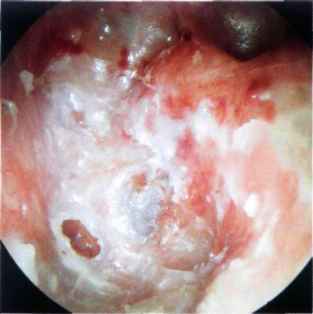 Epitympanic erosion with cholesteato-ma. 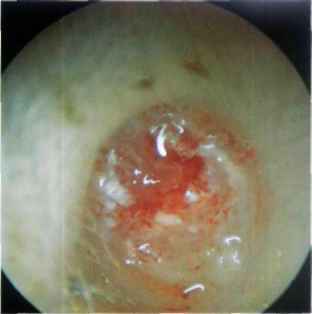 Epidermization of the posterior mesotympanum is seen through a posterior perforation of the tympanic membrane. The tympanic membrane residue has a whitish color. This can be either due to tympanosclerosis or to epidermization of the medial surface of the tympanic membrane. Examination under the microscope can, in many cases, determine the exact cause. 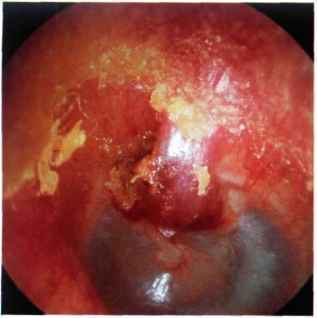 An epitympanic retraction pocket should be regularly checked with otomicroscopy. The 30° rigid endoscope allows visualization of the extent of the retraction pocket that can be difficult with the microscope. When progression of the epithelium into the epitym-panum cannot be controlled, the presence of cholesteatoma is considered. In such cases, surgery should be performed. Whenever a minor epitympan-ic erosion is present, we adopt a closed technique with reconstruction of the attic using cartilage and bone pate. This technique is valid particularly in children where the mastoid is usually very pneumatized. Frequently, surgery is staged in these cases. When a marked attic erosion is present, especially in adults, we perform an open technique to avoid cholesteatoma recurrence that can occur due to absorption of the material used for reconstruction of the attic defect. When preoperative hearing is normal in the presence of attic cholesteatoma with large bony erosion, we perform an open tympanoplasty in the form of a modified Bondy technique. This technique allows single-stage eradication of the disease with conservation of the normal preoperative hearing. Figure 8.25 Right ear. Mesotympanic cholesteatoma. The epithelial squamae can be seen through the retromalleolar perforation. 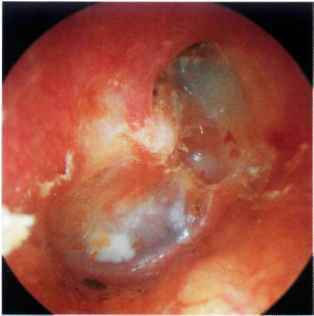 Anterior to the malleus, the cholesteatomatous mass causes bulging and whitish coloration of the tympanic membrane without perforating it. The entire middle ear is filled with cholesteatoma in this case. Figure 8.27 Left ear. Small epitympanic erosion and a mesotympanic retraction pocket with wax and cholesteato-matous squamae. Extension of the cholesteatomatous mass into the anteromalleolar region is seen through the retracted tympanic membrane. Figure 8.28 Right ear. A child with mesotympanic retraction and poste rosu peri or perforation through which cholesteatomatous debris and inflammatory tissue are visible. Purulent discharge is observed. The patient was operated on using a staged closed tympanoplasty. Figure 8.29 Right ear. Posterior perforation with cholesteatoma in the posterior mesotympanum. The cholesteatomatous squamae cover the region of the oval window extending towards the attic and progress anterior to and under the handle of the malleus. The promontory and the round window are visible through the perforation. Figure 8.30 Right ear. 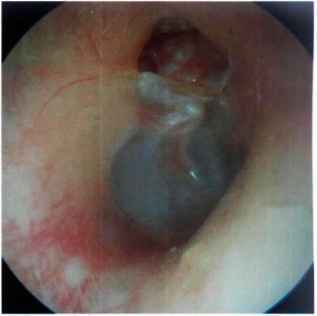 Total tympanic membrane perforation. The handle of the malleus is absent. The long process of the incus and part of the stapes are covered by cholesteatoma, which also involves the promontory. The round window, hypotympanic air cells, and tubal orifice are free of pathology. In these cases, a staged closed tympanoplasty can be performed. Figure 8.31 Right ear. Total perforation of the tympanic membrane. A cholesteatoma completely covers the handle of the malleus and the incudostapedial joint. The presence of a posterior mesotympanic retraction pocket is usually associated with erosion of the ossic-ular chain. Surgery is indicated in these cases. The retraction pocket is completely removed after performing canalplasty of the posterior canal wall. In the same stage, the tympanic membrane is grafted, the posterosuperior quadrant of the tympanic membrane is reinforced, and middle ear aeration is restored using Silastic sheeting. One year later, if the tympanic membrane position remains normal (i.e., not retracted), the ossicular chain is reconstructed. When an extensive erosion of the posterior wall is present, a modified radical mastoidectomy is indicated in the elderly, whereas a staged open tympanoplasty is performed in younger patients. The same strategy is also followed in patients presenting with bilateral cholesteatoma. Figure 8.32 Left ear. Grade IV tympanic membrane atelectasis with posterosuperior mesotympanic retraction pocket. A mixture of wax and cholesteatomatous debris is seen. The middle ear mucosa is visible because of the absence of the epithelial layer. Figure 8.33 Left ear. 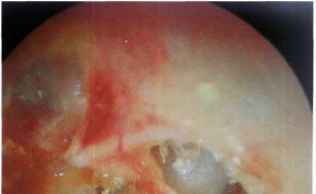 Epitympanic erosion through which a cholesteatoma is shown filling the attic and causing erosion of the head of the malleus. 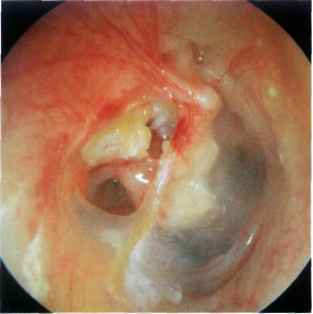 A grade IV atelectasis of the tympanic membrane (adhesive otitis) is seen with formation of polypoidal granulation tissue in the middle ear. In the region posterior to the malleus, the cholesteatoma engulfs the ossic-ular chain. Figure 8.34 Left ear. 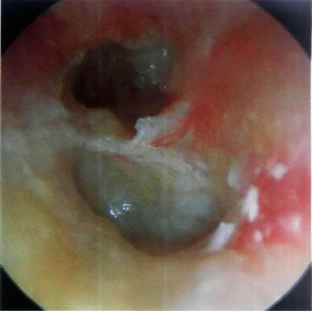 Epitympanic erosion with cholesteatoma associated with atelectasis of the tympanic membrane. The incus is absent. A natural myringostapedopexy has been created. The second portion of the facial nerve is seen superior to the stapes; inferiorly the round window is noted. The anterior part of the tympanic membrane is affected with tympanosclerosis. In these cases, as hearing loss is mild (< 30 dB), a modified radical mastoidectomy is indicated to maintain the normal preoperative hearing level obtained as a result of the spontaneous myringostapedopexy. Figure 8.35 Right ear. Epitympanic cholesteatoma associated with complete atelectasis of the tympanic membrane (see CTscan, Fig. 8.36). Figure 8.36 CT scan of the previous case. 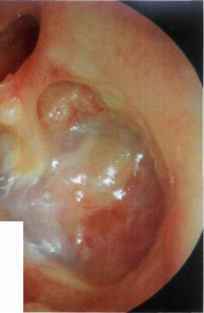 An epitympanic cholesteatoma is found. 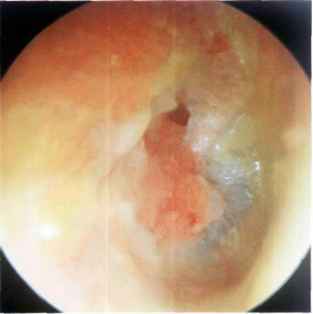 Adhesions between the tympanic membrane and the promontory can be observed. This 45-year-old woman underwent a modified radical mastoidecto-my with no interference in the middle ear. In adult patients with extended epitympanic erosion or with bilateral cholesteatoma we prefer to perform an open technique. In all cases in which a spontaneous tympanostapedopexy with normal preopera-tive hearing or elderly patients with normal contralateral hearing, we prefer to leave the atelectatic tympanic membrane untouched after having verified the absence of any middle ear cholesteatoma. In the presence of mesotympanic cholesteatoma, staging is indicated. In the first operation a closed tympanoplasty is performed with reconstruction of the tympanic membrane, and a Silastic sheet is positioned in the middle ear. Silastic favors regeneration of the middle ear mucosa and prevents the formation of adhesions. In the second stage, performed 6 to 8 months later, the middle ear is checked for the presence of any residual cholesteatoma. The ossicular chain is then reconstructed using, preferably, an autologous incus. In children we always try to perform a staged closed tympanoplasty. If a recurrent cholesteatoma (epitympanic retraction pocket) is encountered in the second stage, we do not hesitate to transform it into an open technique. (see Fig. 8.38). 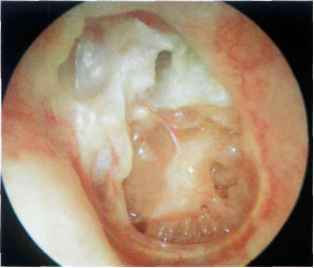 In such cases, because of the presence of marked epitympanic erosion and of the fistula, an open tym-panoplasty is preferred. Figure 8.38 Intraoperative view of the previous case. A fistula of the lateral semicircular canal is clearly seen. Figure 8.40 CT scan of the previous case. A huge cholesteatoma causing a fistula of the lateral semicircular canal and erosion of the tegmen can be seen. Figure 8.39 Left ear. Large polyp obstructing the external auditory canal. The patient complained of fetid otorrhea, hearing loss, and vertigo. A high resolution CT scan of the temporal bone was ordered (see Fig. 8.40). A CT scan of the temporal bone should always be ordered in patients with chronic suppurative otitis media suffering from vertigo and/or instability. Figure 8.41 Right ear. Epi- and mesotympanic cholesteatoma. The cholesteatomatous debris protruded through the epitympanic erosion. In the posterosuperior quadrant, the cho-lesteatomatous sac can be seen in transparency, causing bulging of the tympanic membrane. The skin surrounding the attic erosion is hyperemic. The pars tensa is intact. The patient complained of frequent episodes of vertigo. A CT scan (see Fig. 8.42) demonstrated the presence of a fistula of the lateral semicircular canal. Figure 8.42 CT scan of the previous case. The interruption of the lateral semicircular canal caused by the cholesteatoma is apparent. Figure 8.43 Left ear. 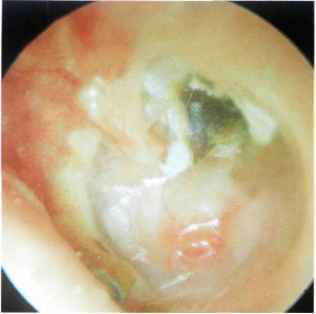 Small epitympanic retraction pocket in a patient presenting with hearing loss, tinnitus, and recurrent episodes of otitis media with effusion. The contralateral ear had been operated on elsewhere using an open tympanoplasty that resulted in total hearing loss and facial nerve paralysis. 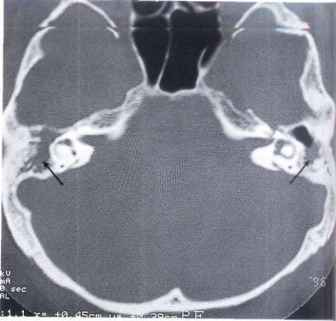 A CT scan of the temporal bone revealed the presence of an epitympanic cholesteatoma that caused a fistula of the superior semicircular canal and erosion of the tegmen (see Fig. 8.44). The patient underwent open tympanoplasty. Being the only hearing ear, the cholesteatoma matrix was left over the fistula, whereas the tegmental erosion was repaired using cartilage to avoid a meningo-encephalic herniation (see Chapter 12). Figure 8.44 CT scan of the previous case. Cholesteatoma caused a fistula of the superior semicircular canal and erosion of the tegmen. Figure 8.45 Left ear. This patient had already undergone bilateral radical mastoidectomy elsewhere. 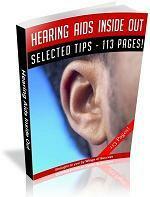 He presented with profound bilateral hearing loss and fetid otorrhea from his left ear. 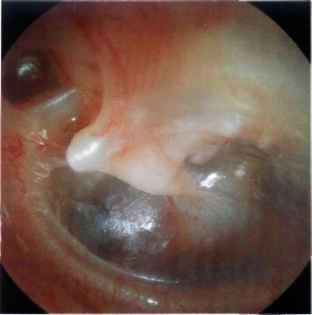 During revision surgery, a cholesteatoma causing a cochlear fistula was found. This patient suffered profound hearing loss in the other ear, thus the cholesteatoma matrix was left over the fistula to avoid deaf ear. 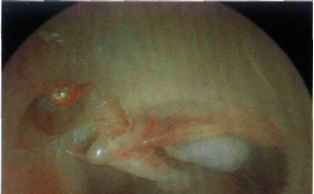 Figure 8.46 Polyp in the external auditory canal with purulent discharge. A cholesteatoma is frequently found behind such a polyp. In such cases, biopsy is not indicated as a CT scan is often used to differentiate cholesteatoma from other pathologies (glomus, carcinoid, or carcinoma). A tympanoplasty revealed the presence of a large cholesteatoma occupying the attic and mesotympanum. At present, with the diagnostic methods at hand and increased medical care, it is very rare to find a cholesteatoma with intracranial complications (e.g., meningitis, brain abscess, lateral sinus thrombophlebitis, etc.). However, cases of cholesteatoma with massive bone destruction, labyrinthine fistulae, severe sensorineural hearing loss resulting in deaf ear, and facial nerve paralysis are not infrequently encountered. In general, it is not necessary to order a CT scan to diagnose a cholesteatoma. However, in the presence of headache, vertigo, facial nerve paralysis, severe sensorineural hearing loss, or sudden deafness, a high-resolution CT scan of the temporal bone becomes highly important. Axial and coronal cuts without contrast are required. When intracranial complications are suspected, contrast injection is also needed. A labyrinthine fistula is found in less than 10% of cases. The lateral semicircular canal, being the most superficial, is the most commonly involved. Treatment of a labyrinthine fistula depends on the type (bony or membranous) and size of the fistula. A tegmental erosion can be repaired using cartilage and bone pate. Facial nerve paralysis is either due to infection of the exposed nerve or secondary to compression by the cholesteatoma. In the majority of cases, removing the cholesteatoma and clearing the infection are sufficient for the paralysis to resolve. It is very rare to find fibro-sis or thinning of the nerve. In these cases, facial nerve reconstruction varies from rerouting and end-to-end anastomosis to nerve grafting, according to the degree of injury and length of the injured segment. 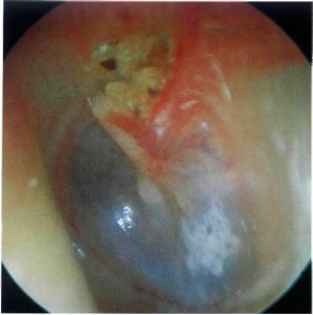 Congenital cholesteatoma is defined as an epidermoid cyst that develops behind an intact tympanic membrane in a patient with no history of otorrhea, trauma, or previous ear surgery. Michaels studied fetal temporal bones and demonstrated the presence of an epider-moid structure between 10 and 33 weeks of gestation. This structure tends to involute spontaneously until it completely disappears. Michaels hypothesized that the persistence of this structure could act as an anlage and lead to congenital cholesteatoma. The fact that the most classic location of congenital cholesteatoma, namely in the anterosuperior part of the tympanum, corresponds to the site of the fetal Michaels structure supports this theory. In our cases, however, and contrary to the few studies reported in the literature (Derlacki and Clemis 1965, Friedberg 1994, Levenson et al. 1989, Cohen 1987), the most common site of congenital cholesteatoma was the posterior mesotympa-num (see Table 9.1). As no existing theory can truly explain the origin of congenital cholesteatoma in the posterior location, a strong conjecture can be made that these lesions might represent a different entity from those of the anterior location and may originate from epithelial cell rests that are trapped in the posterior mesotympanum during the development of the temporal bone. Diagnosis is either occasional in the asymptomatic patient, or the patient may complain of hearing loss due to erosion of the ossicular chain or of recurrent attacks of secretory otitis media due to occlusion of the tubal orifice by the cholesteatomatous mass. A high degree of suspicion and thorough examination are essential in detecting the presence of these lesions. What is a hyperemic ear canal? What does hyperemia of ear drum look like? 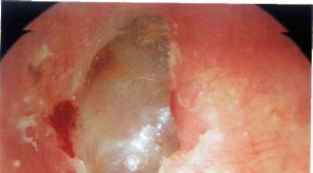 What is injected tympanic membrane?